Swan Upping is an event which takes place in the third week of July each year. Dating back many centuries, the event has roots in the Crown’s ownership of all Mute Swans (which dates back to the 12th century), ownership which is shared with two of London’s livery companies, the Worshipful Company of Vintners and the Worshipful Company of Dyers who were granted rights of ownership in the 15th century. 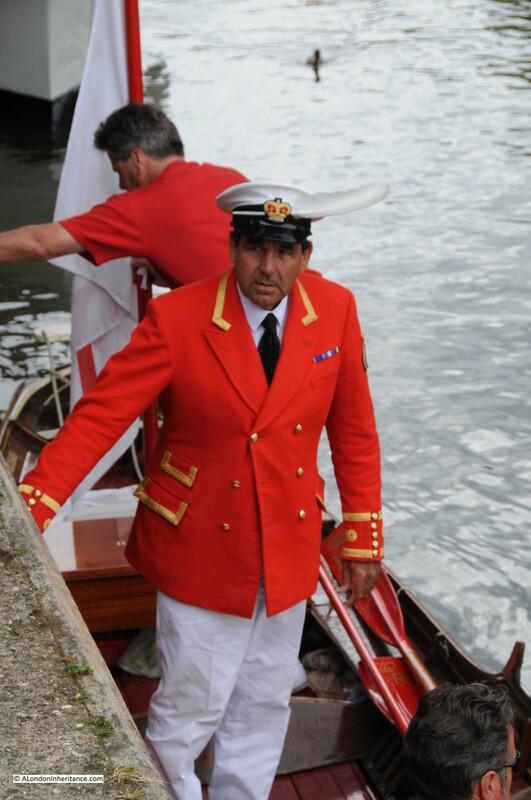 Swan Upping is the annual search of the Thames for all Mute Swans, originally to ensure their ownership is marked, but today more for conservation purposes (counting the number of swans and cygnets, checking their health, taking measurements etc. ), although the year’s new cygnets are still marked. 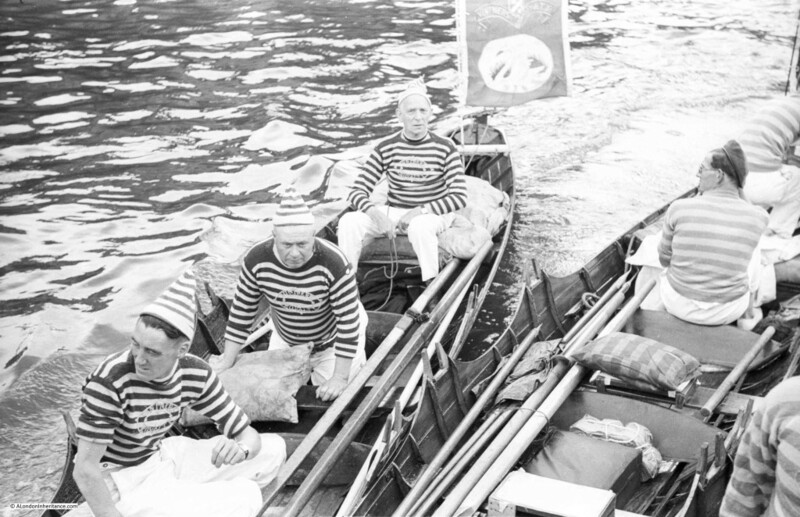 Six traditional Thames rowing skiffs are used to travel the river. Two for the Queen’s Swan Marker and Royal Swan Uppers and two each for the Vintners and Dyers. 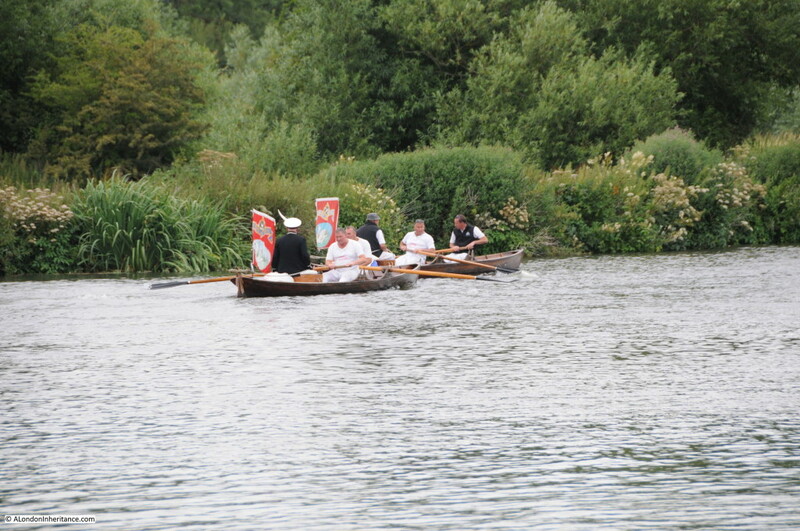 Originally starting in the City of London and running to Henley, Swan Upping now starts in Sunbury and travels the Thames over a 5 day period to finish in Abingdon. The move out of central London was due to the lack of breeding Mute Swans, with the main area for breeding now being further upstream. The Swan Uppers search the river for Mute Swans and their cygnets and on sighting fence the swans in with their boats, then record, mark the cygnets, measure and check their health before moving on. 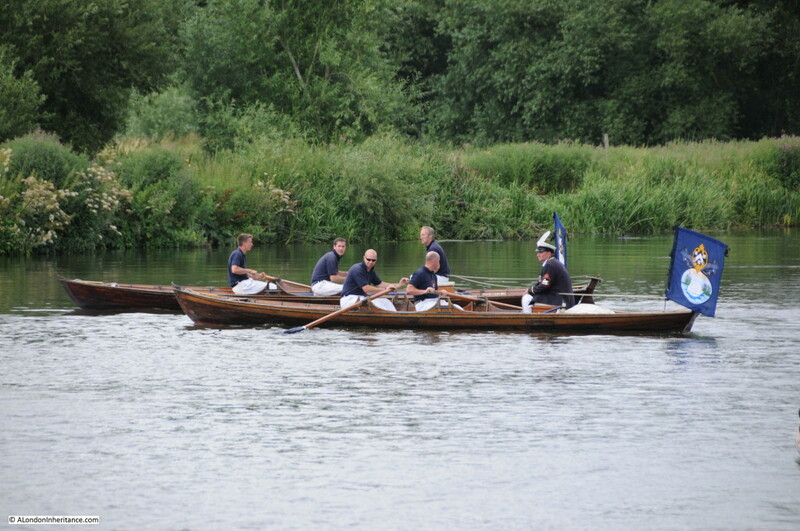 Swan Upping takes place in the third week of July as by this time cygnets are reasonably well grown but have not yet reached the stage when they can fly. 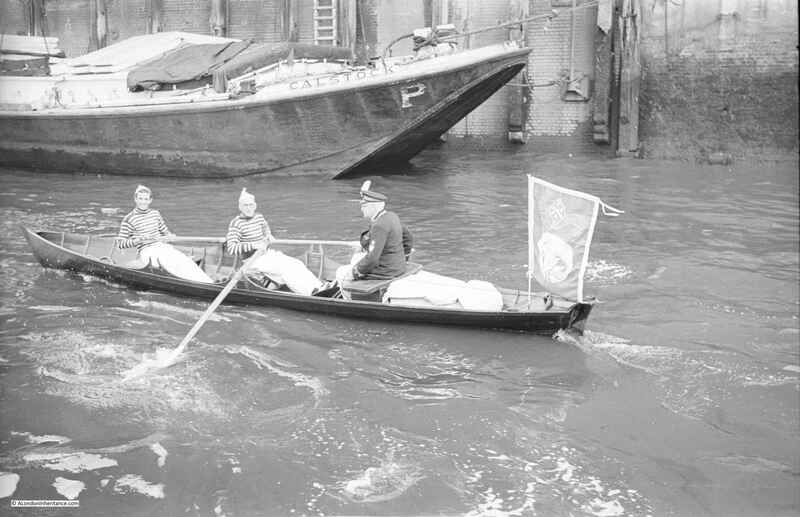 My father took photos of the event when it still had a City of London start, on Swan Wharf at the end of Swan Lane, near London Bridge. He did not date the photos, but from checking photos on the same strips of negatives, I am reasonably certain that the year was 1953. 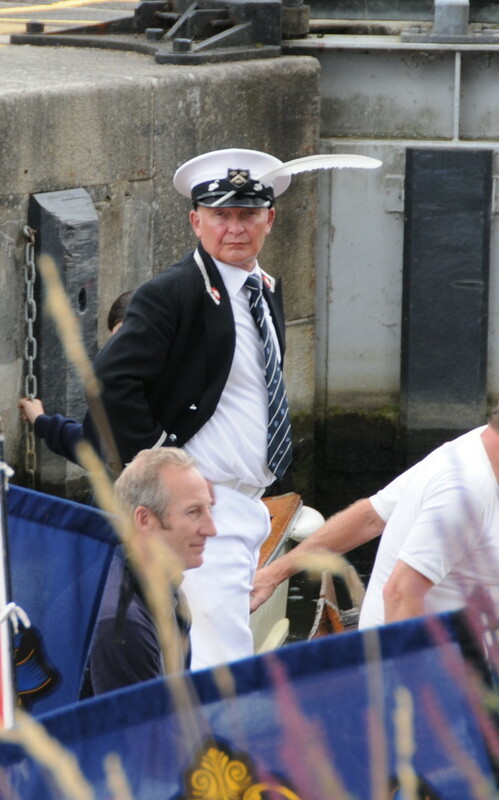 This year, in amongst work and other commitments I was able to fit in a visit to Goring in South Oxfordshire to see the Swan Uppers pass through the lock on their way along the Thames. 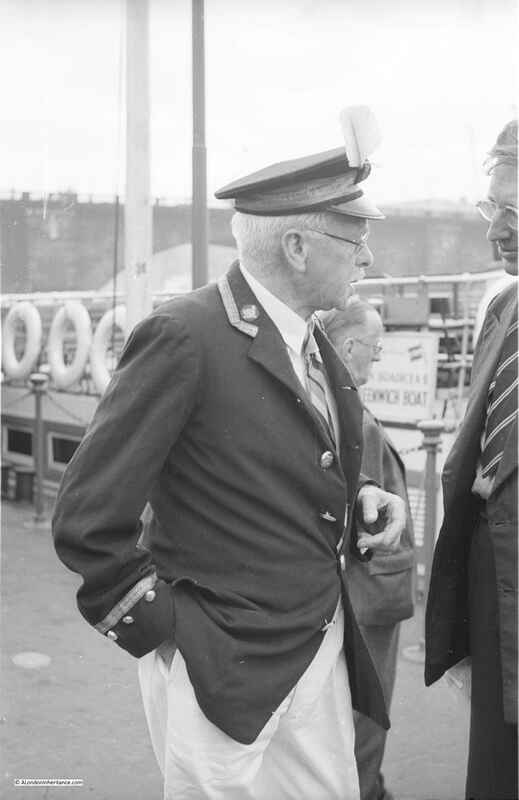 This is my father’s photo of Mr Richard Turk who was the Vintners Swan Marker and Barge Master. 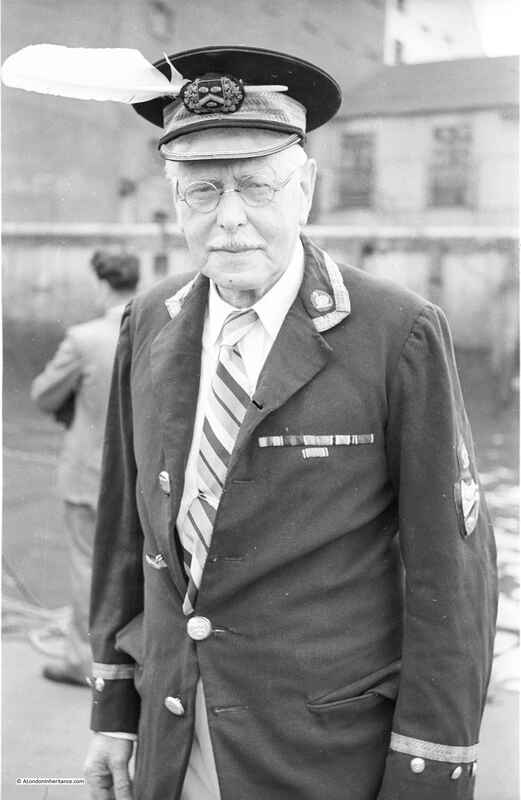 He held this position from 1904 to 1960. 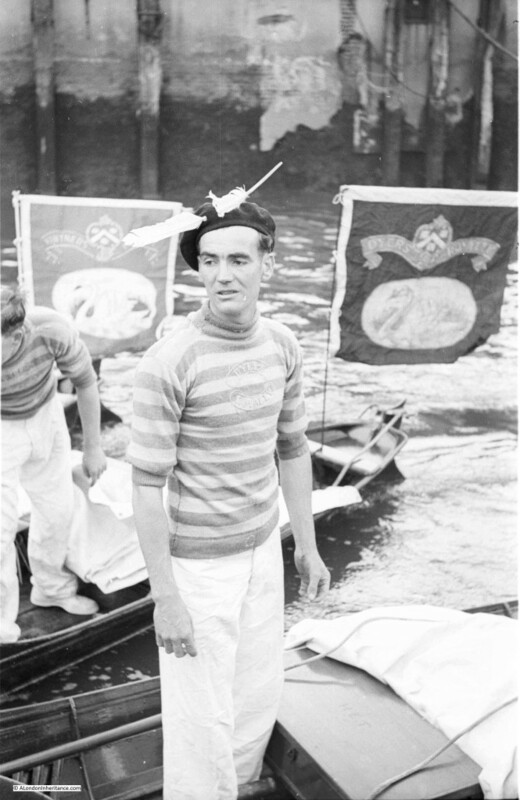 A remarkable period of time to hold the role and the changes he must have seen along the Thames as Swan Upping was performed each year must have been fascinating. And today’s Vintners Swan Marker and Barge Master at Goring lock. 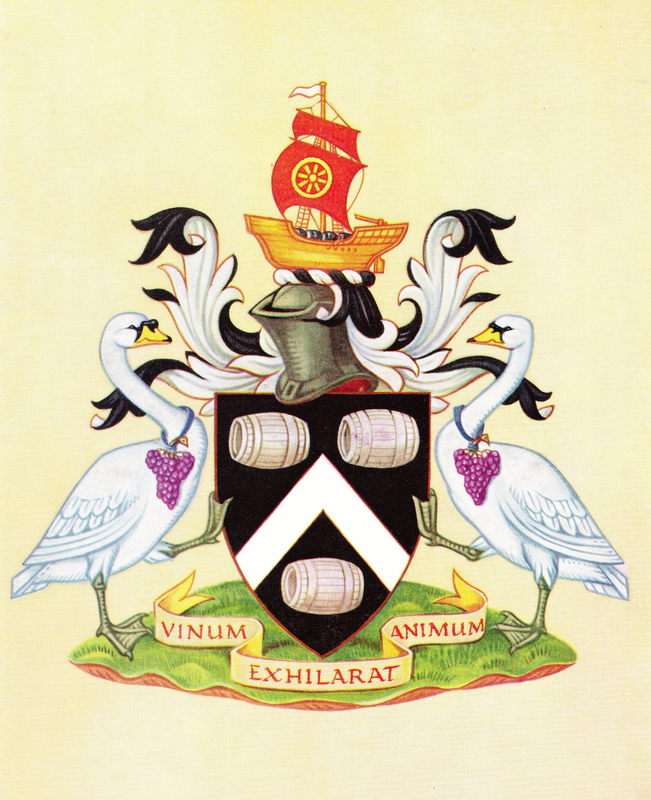 The cap badge of the Vinters Swan Marker and Barge Master is taken from the armorial bearings of the Vintners Company with the chevron and three wine barrels being used. The swans on either side refer to the ancient rights of the Vinters to own swans on the Thames. One of the 1953 Swan Uppers. The flags of the Vinters and Dyers are very similar. The flag on the right is the Dyers flag and on the left is the Vinters. Swan Uppers from the Vinters Company. On the back of this photo my father had written that on the right is Mr E. Lefever and in the centre is Mr G. Cole. Another view taken by my father of one of the Vinters boats. The flags are the same today. Vinters boat on the left with a Dyers boat on the right. 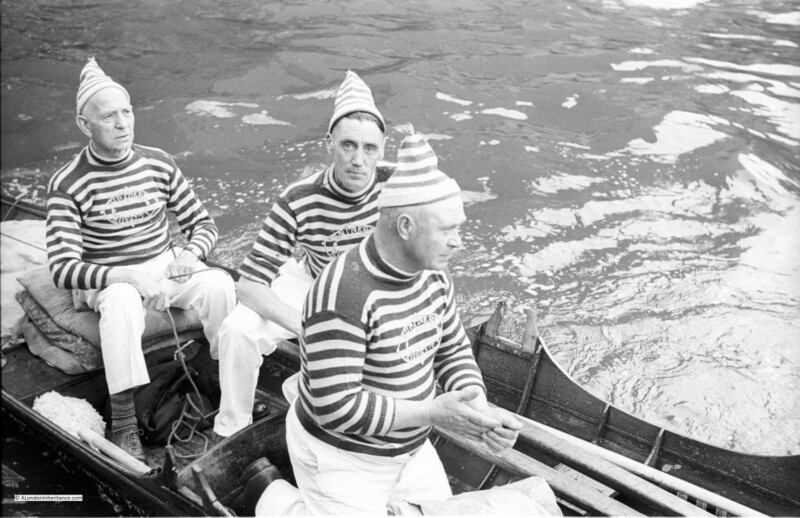 In 1953 Dyers wore caps with the Vinters wearing what looks like some form of woollen conical hats, continuing the same stripes as on the jumpers. 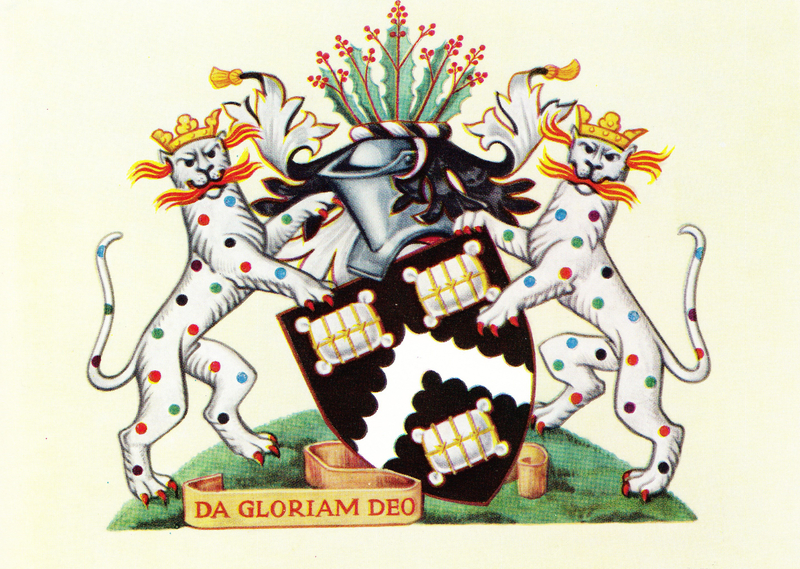 Today, headgear and striped jumpers have been replaced by less colourful attire, however the shirts still bear the badge of the relevant livery company. 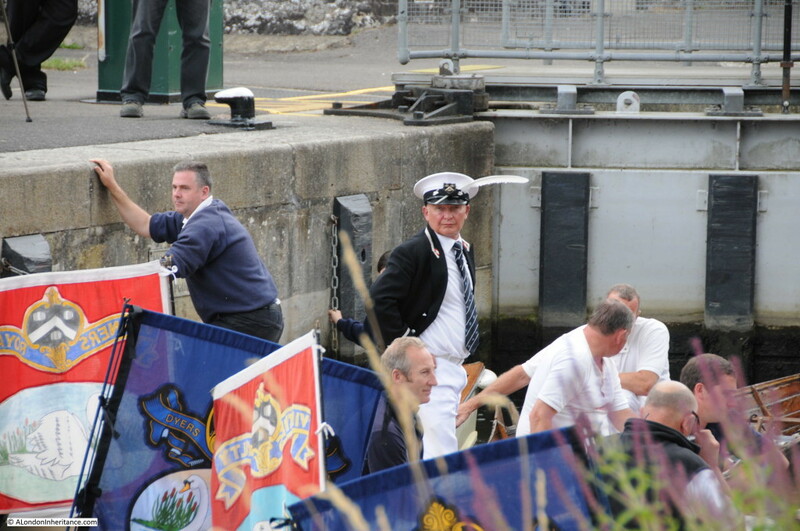 The Swan Uppers waiting for the lock gates to open on their way further up the Thames. 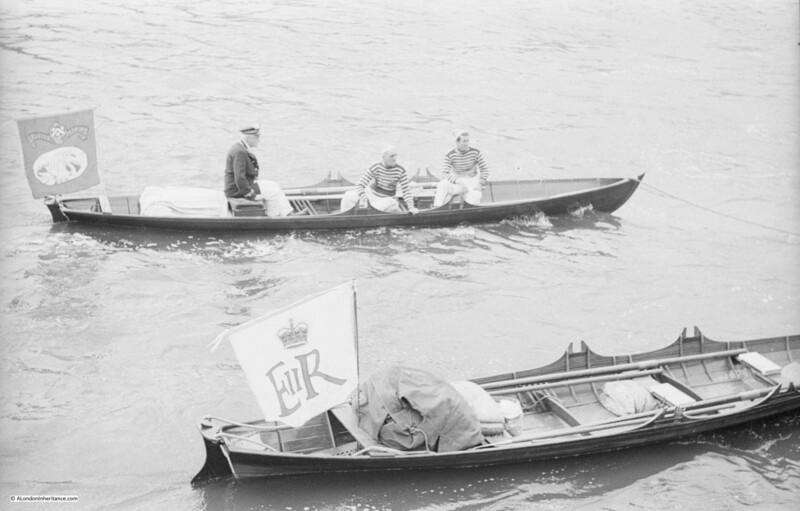 In the following 1953 photo one of the Vinters boats passes one of the barges that lined the banks of the Thames. 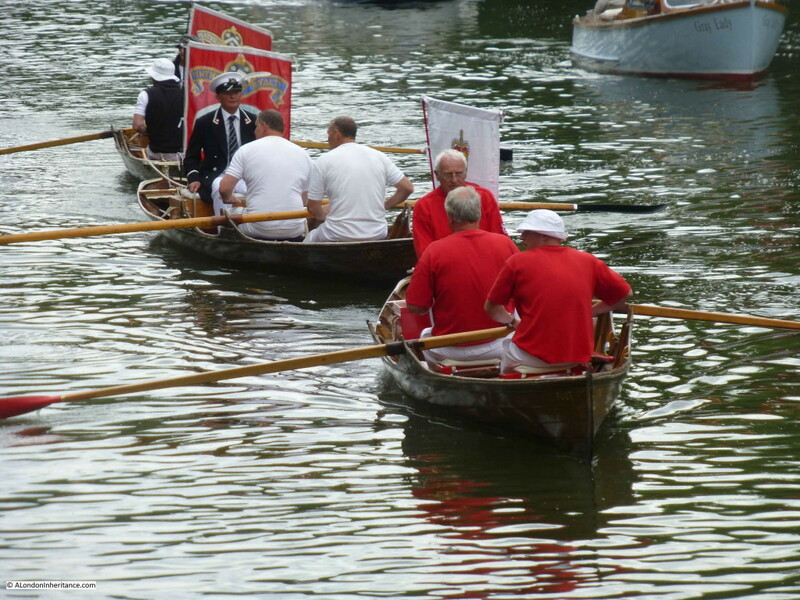 The reason for Swan Upping now starting in Sunbury was the lack of breeding Mute Swans in central London, however I was surprised that this was only a relatively recent change which implies there were breeding Mute Swans on the river in central London in the post war period. A time when there was far more industry along the banks of the Thames and it was a much dirtier river. I suspect the difference being that the Thames did have many wharfs and gradual foreshore leading up the bank and plenty of inlets whereas the river today through central London now runs through a channel with vertical embankments on either side. When swans are caught, the cygnets are marked according to the ownership of their parent birds. Cygnets allocated to the Livery Companies will have rings placed on their legs by the Livery Company swan marker. 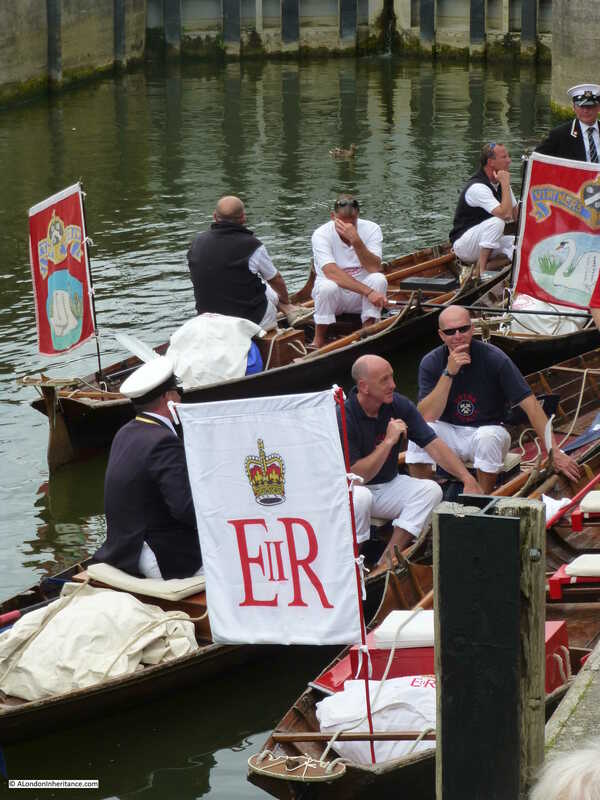 Swans owned by the Queen are left unmarked. When the parents have different owners, the Cygnets are split between the owners of the parent birds and when there is an odd number, the remaining cygnet will be allocated to the owner of the male bird. The Queen’s Swan Marker and Barge Master is responsible for establishing ownership of the parent birds. Swans are having a challenging time on the river. On the original route between London and Henley, numbers were low at the start of the last century, but grew steadily till the start of the 2nd World War, when numbers fell, but then rising again to reach more than 1300 birds by the mid 1960s. Numbers then dropped dramatically, down to only 7 pairs in 1985. The significant reduction attributed to the use of lead weights in fishing, these have now been banned. Numbers are still low. On the route from Sunbury to Abingdon in 2014 there were 34 broods with 120 cygnets, numbers at the low-end of the past 12 years. This year’s results will be released in the coming week. 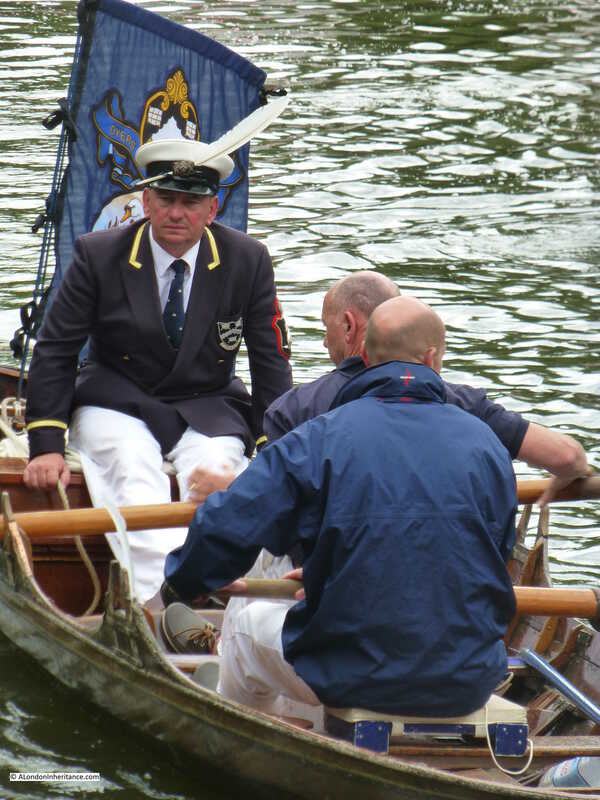 It was fascinating to watch this event at Goring. 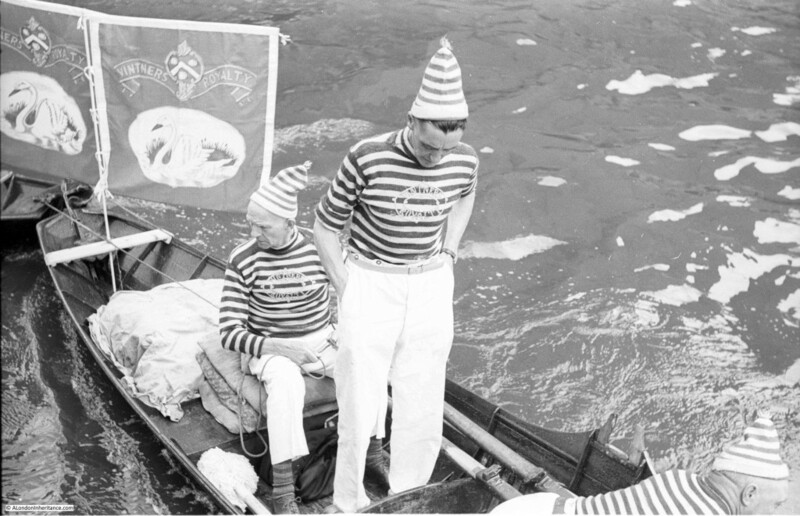 Although Swan Upping has now moved out of central London, the Livery Companies maintain the link with the City and Swan Upping now performs the very important task of monitoring the health and numbers of Mute Swans on the Thames. 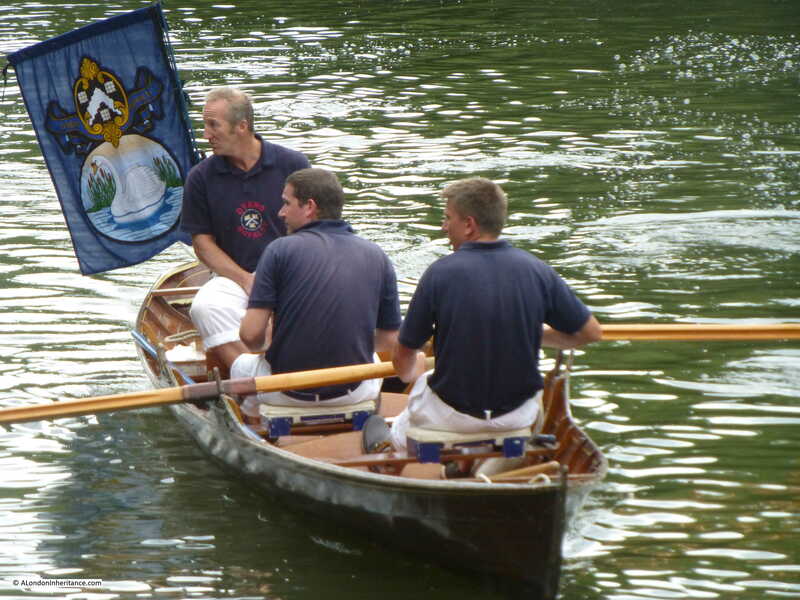 This entry was posted in Events and Ceremonies, The Thames and tagged Dyers Company, Goring, Livery Companies, River Thames, Swan Upping, Vintners Company on July 26, 2015 by admin. Air rifles, mink and destruction of nests and eggs all implicated. Thanks for the link Vivienne. A very depressing message. The dyers company have a table on their site at http://www.dyerscompany.co.uk/ which does show fluctuating numbers, but what appears to be a gradual decline. This year does look bad. Love the photo’s of Mr Richard Turk in his work-worn blazer, plus the swan-uppers in their pixie hats. Great to know the traditions continue – Interesting that the black & white photo’s are more ‘colourful’ then the colour photo’s! Not a reflectionon your photography, more a relection on the quaintness of the 1950’s swan-uppers. There is something about black & white photos. I have often thought about using black & white rather than colour. Might try it out in a future post. What a great blog on the Swan Masters. My name is Richard Turk…and I live in Lone Tree, Colorado USA. My father John Turk visited with Frederick “John” Turk back around 1972-73 on a trip to London. They had a delightful tea with John as I can best remember. You know how family stories can go. My Dad was reading an article in National Geographic on the Thames…it had a portrait of John….and my Dad said that is my twin!!!! So he made contact before the trip. We would love to find out more about the genealogy of the early Turks. This is a fascinating post. Thank you! I am looking into which of the livery companies (in addition to the Vintners and Dyers) had the right to own and mark swans in the 16th century. The Wax Chandlers were among those, apparently: the company’s records for 1530-2 include payments of £1 0s 1.5d for a swan-herd, boat hire, meat and drink for swan-upping (http://www.waxchandlers.org.uk/origins/chronology-of-the-companys-history.php). I’d be most interested if you or other readers of this page know of other companies with similar rights during the 16th century.